So while the creation this year of the new Augusta National Women's Amateur was a major milestone for a club that has never rushed into anything willy-nilly, any attendees at the Chairman Fred Ridley's annual press conference hoping for earth-shattering revelations were sorely disappointed. The won't create a Women’s Masters at Augusta National either or bring in a Masters ball. The last US Amateur champion to resist the temptation to play for pay, Ridley did reveal that the club has just begun construction of a tunnel under Washington Road that will connect the course to the planned new Global Broadcast Village. He also announced that visitors to Masters.com will be able to see video of "virtually every shot hit" by every player this year. "This extensive library of content will be available on our web site and apps through the leaderboard and track features," he said. "Within minutes of every shot, this added content will now allow our fans online to follow their favourite players from their drive off the first tee to their final putt on the 18th green." When it comes to the lengthening the 510-yard 13th by moving the tee back, that's not happening any time soon. "Admittedly, that hole does not play as it was intended to play by Jones and MacKenzie," he said. "The momentous decision that I've spoken about and that Bobby Jones often spoke about, of going for the green in two, is to a large extent, no longer relevant. "Although we now have options to increase the length of this hole, we intend to wait to see how distance may be addressed by the governing bodies before we take any action." A Masters ball, it appears, is definitely out, which is no surprise given the resistance of players, the commercial and legal ramifications and the technical difficulties that could crop up. 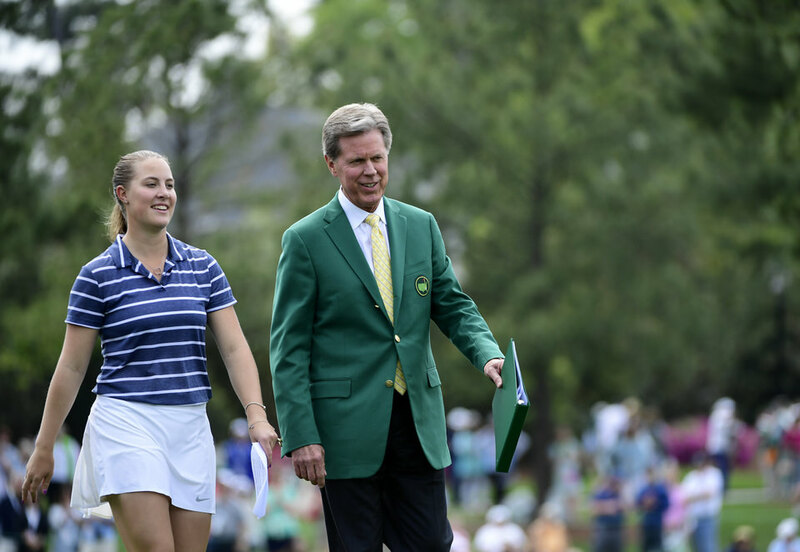 As for the decision to stage the Augusta National Women’s Amateur instead of a professional event, such as a women's Masters, he reminded everyone of the club’s commitment to the amateur game. "I think part of that kind of goes back to history, and that is that Augusta National was founded, co‑founded by the greatest amateur of all time," he said in reference to Bobby Jones. "To date, all of our grow‑the‑game initiatives have been focused on amateur golf and amateur golfers. "In this particular case, we elected to conduct a women's amateur tournament for really that same reason, but we really wanted this to continue in a grow‑the‑game sort of mode. But having said that, I do think that what has happened is going to translate and be a real benefit for professional golf and for the LPGA." He pointed out that winner Jennifer Kupcho and runner-up Maria Fassi and now well-known worldwide, long before they take up their LPGA Tour cards. "They were in New York on Monday, as most of you know, on The Today Show, and Jimmy Fallon," he said. "I heard reports they were walking the streets of New York and people recognised and walked up to them. "I have to think that that's going to be good for women's golf in general and I think they are going to be well received by the LPGA and are going to get off to a great start in their careers there."